It's that time of year again! SPRING has arrived. Birds are chirping, flowers are blooming and outside it smells like fresh-cut grass. It's also the time of year that everyone's thinking about Spring Cleaning. But at Delicious Reads, we like to put a fun spin on everything. 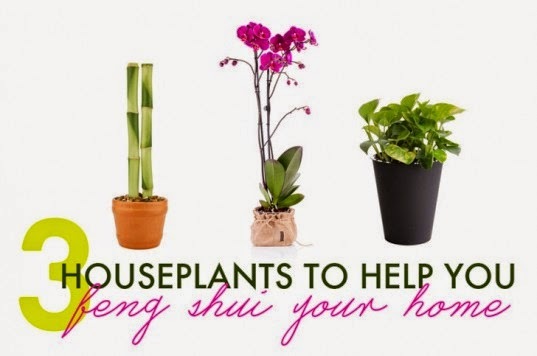 Why just Spring Clean when you can bring a little Feng Shui into your home? 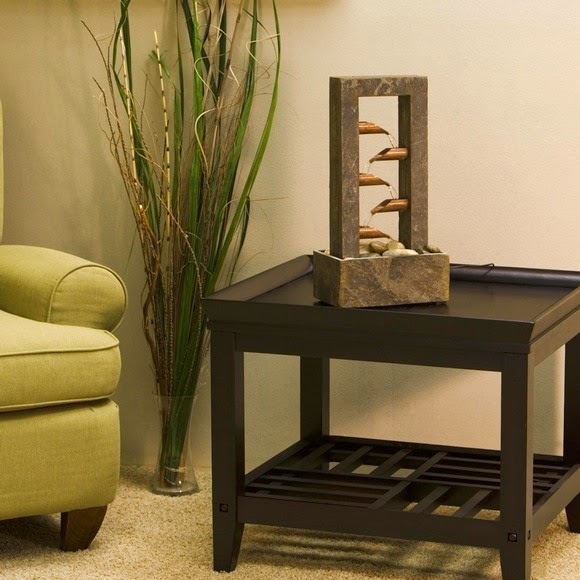 Basically, Feng Shui is a way to create balance between the energies in a given space. It's an ancient art and science developed over 3000 years ago in China. Feng means wind and Shui means water. Without air and water, we couldn't survive. In Feng Shui philosophy, the spring represents new beginnings, growth and expansion. So let's get started! 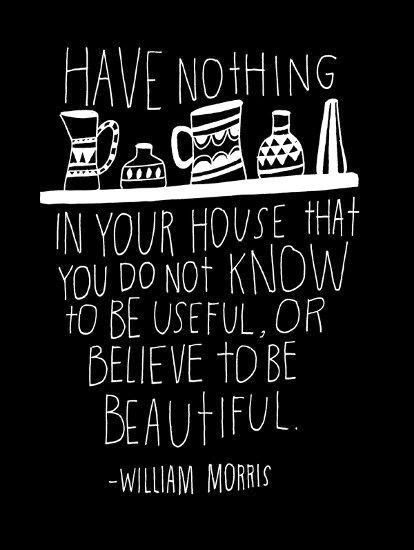 Clutter chokes positive energy flow in your home. It stresses you out on a subconscious level. So the first step is to get rid of things you no longer need or are taking up too much space. One reason so many people put this off is because it can be time consuming and sometimes you will have emotional attachments to items that make it hard to throw them away. Let's break it down so it's manageable. Relocate items that don't really belong there: work related items/papers, receipts, workout equipment, items that need to be stored. Go through your clothes. If you haven't worn something in six months, donate it. Let's be honest... are you REALLY going to wear it again? Open the windows at least once a day for twenty minutes to air out your room. Be sure your bed is a prominent position that does not face a television (or have a way to cover up the TV). Make sure you have a few plants to help circulate positive energy. In Feng Shui, the Kitchen is directly connected to the state of your health. In particular, your liver. Your liver is in charge of detoxing your whole body. So be sure to take this one seriously! Clear off that fridge. Get rid of papers that have been hanging there for a while (do you still have Christmas cards up? Or last month's calendar?) Wash down your appliances and light fixtures. De-grime. 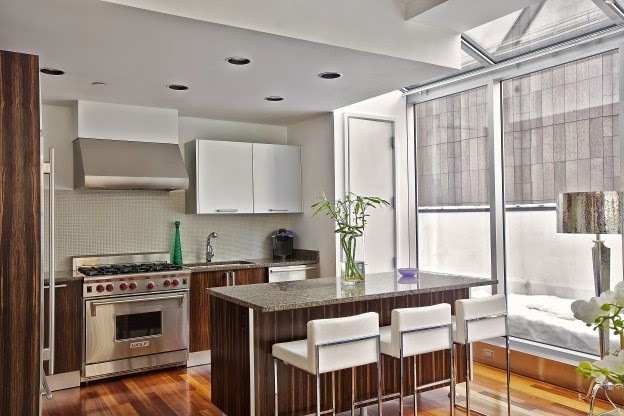 Put away small appliances that you don't use very often to create more open counter space. 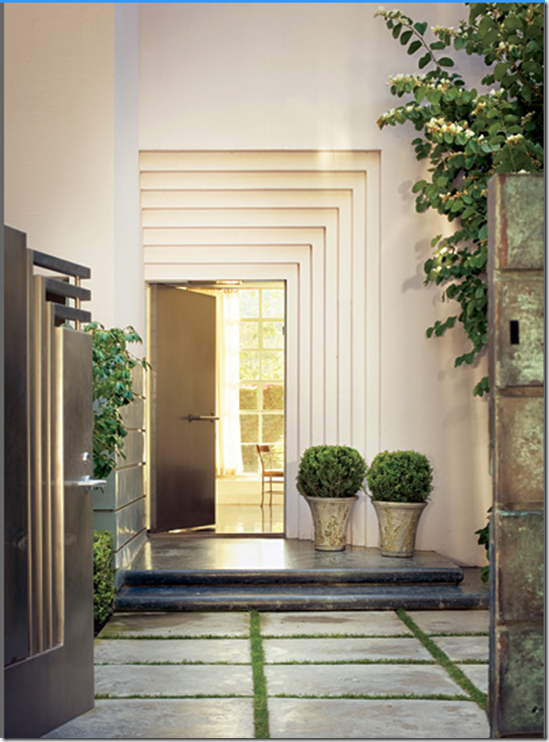 Make the entrance to your home enticing! The way your entrance looks is very important in Feng Shui because it's the grounding or centering area for all who enter. The quality of the energy at your front door will circulate all through your house. Get rid of any plants or trees that are unhealthy or have died. Find another area for your garbage or recycling bins that are out of view from the front door. Get rid of any chipped pots or other items that look tattered. If there are items in you entryway that are now out of season (how many people still have a pile of winter boots lying around? ), find another location for them. Charm your visitors with plants, a water feature and wind chimes near your greeting area. Plants will increase the flow of energy in your house. You will feel a whole new vitality to your home when you add in some greenery. Lucky Bamboo- Bamboo is a plant that is abundant in Asia and grows very quickly. It represents upright and honest growth, as well as flexibility and adaptability. Since the bamboo plant does not flower or fruit, it’s lifespan is long and simple. Potted Orchids- Orchids are graceful flowering plants. The flowers are long lasting and come in a variety of shapes, sizes, and colors. They can bloom all year round, even in the coldest winter. Orchids not only absorb carbon dioxide but they release oxygen at night, which make them ideal for bedrooms. They can also help us sleep better because of this fact. Golden Pothos- This green plant is a vine with heart shaped leaves. This plant is suitable for those with the blackest of thumbs. My plant has survived weeks of forgetful watering and even a dark ground floor apartment. They’re also very insect resistant. The sound of water has a healing element. Water will also increase the flow of energy in your house. I like this water feature too. Books encourage learning for you both you and and your children. Plus you can add so much charm and personality to your home. 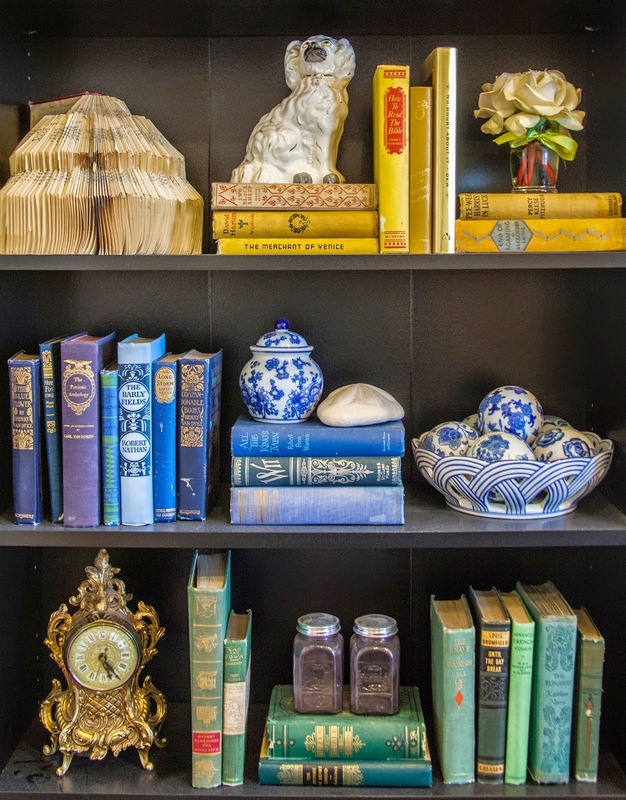 Here's our latest post on How To Style Your Bookshelves. Colors have a huge impact on us. 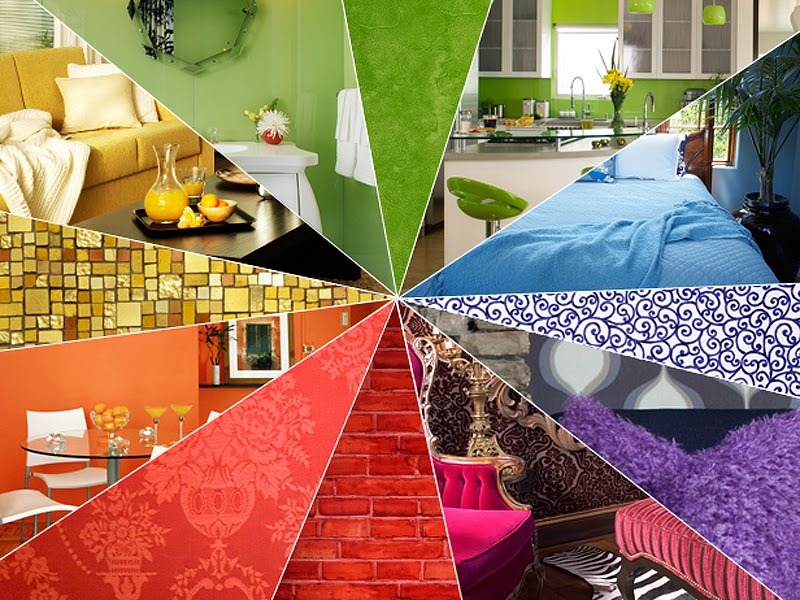 Update your color scheme to reflect your current tastes. Quick fixes like painting a wall or getting new rugs or pillows can give the room of your choice a quick face-lift and revitalize the energy of the room. If you want to get even further into Feng Shui, you can arrange your house to reflect this grid to help the energy flow through your home. 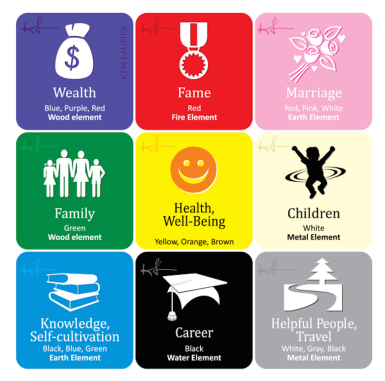 It's called a Bagua, which means eight areas. Basically you position this grid over the layout of your house, putting the lowest row at your front door. Once you know the elements that go with certain areas of your house, you can learn tricks to incorporate more of the feng shui techniques for each area. This is more in depth than I'll go into here, but I wanted to give you an overview since it's a big part of Feng Shui. Well I hope these tips help you get the basics of Feng Shui. Spring is the perfect time to begin incorporating these techniques. You'll definitely feel a shift in the energy and overall attitude of people in your home. Happy Spring everyone! A great part of the research on the gainful houseplants has been finished by NASA scientists researching approaches to make suitable space station territories.All indoors plants (flowering or not) have the capacity to cleanse indoor air to some degree through their normal photosynthesis forms.Be that as it may,some were observed to be more valuable than others in uprooting harmful household toxins,notwithstanding evacuating 90% of chemicals in the air in just twenty-four hours! Amazing post. really appreciate that. I would love to read more. Great tips. This is very useful post. Thanks for sharing. I am really surprised to know about Feng Shui. In fact, I have not known about it before. As spring arrives, I need to clean my windows very much. For this purpose, I always call to ēkoserve cleaning services. Salman khan will be coming on the occasion of christmas with his upcoming blockbuster flick Tiger Zinda Hai 2017. Thanks for the post. You are amazing. Such a great article. I really liked this post. Thanks for sharing this post with us. The procedure to download HD Movie Online on Android or Apple is not at all hard. You just have to follow my guidelines in this post to make Movie HD Free Download.